Easy to use. Nice looking controls. App can run on many different devices, and bypasses marketplace. Could use some more features such as AJAX and more data handling. When you develop for mobile devices these days, you pretty much have two paths you can take: You can use the OS manufacturer's SDK and develop native apps, or you can create an application that runs in the device's web browser. It's also easier because you can develop on nearly any desktop computer. If I want to develop an iPhone app, I don't need the SDK that runs on a Mac; instead, I can create the application right on my Windows desktop. For me as a web developer, this is a much more enticing approach to developing an application. I do a huge amount of custom work for clients, and almost all of my work over the past decade has been browser-based. In the last two years, I've written almost no desktop applications. And it's always cool to grab an iPhone or Android, open up the browser, and try out the app, and see it working just fine. There are several approaches I can take, as there are many new libraries out there to help simplify the process of mobile browser development. jQuery now has a mobile version (although it doesn't bear much resemblance to the regular jQuery). 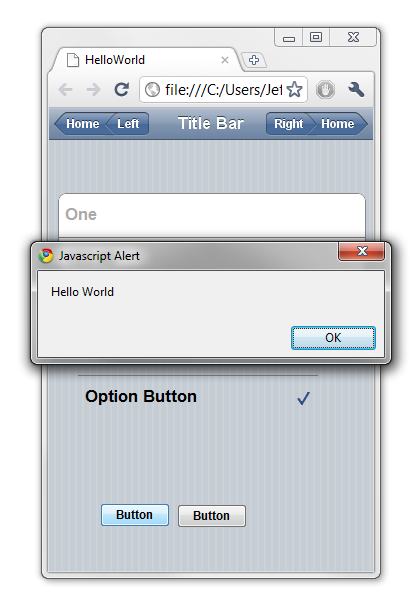 Sencha has a mobile version as well, which does have a lot of similarities to its desktop browser sibling, ExtJS. But what else is there? There's a company in Toronto that you've probably heard of: NS Basic. They've been around nearly 20 years, and have been creating development tools centered around the Basic programming language, primarily for handheld devices. Their latest offering is an IDE called NS Basic/App Studio that lets you write Basic programs that run in the mobile browser. And from that perspective, I'm pretty impressed. 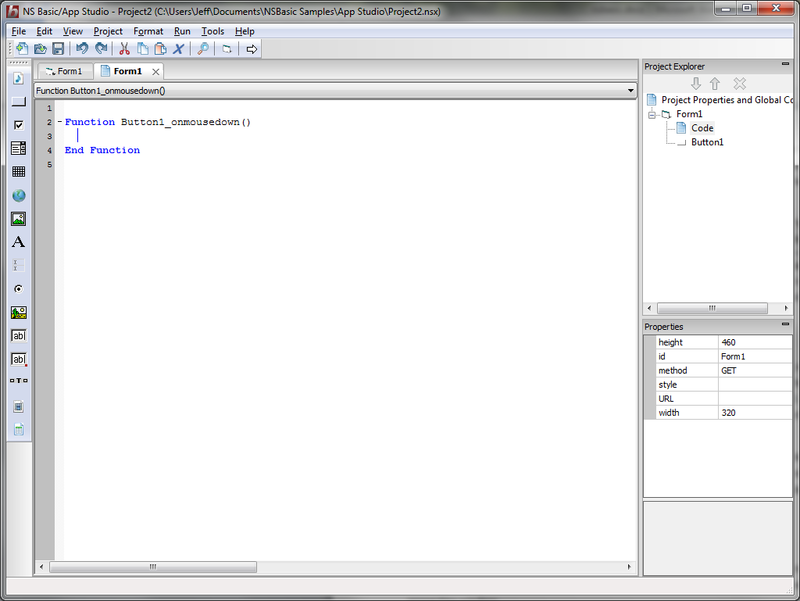 Using NS Basic/App Studio reminded me of the original Visual Basic IDE. Simply put, you can get a form that you can drop controls onto. You can attach event handler code to the controls. Then you can try it out in the browser on your desktop. You can see the form in the middle part. On the left is a small toolbox that has controls you can drop on your form. This sample form has a few such controls on it. 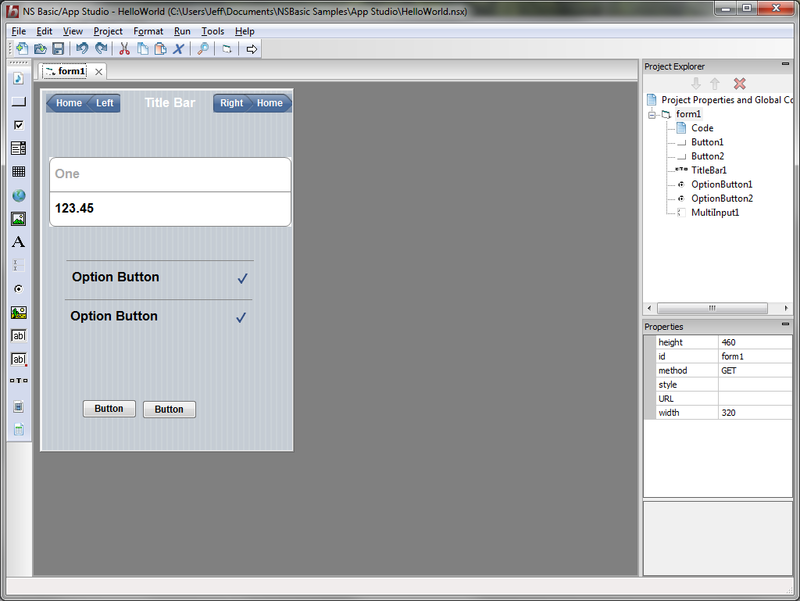 Then on the right is the project explorer, along with a properties window. 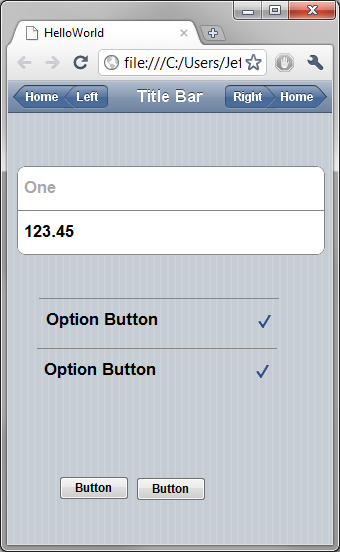 It's clear when I use this that the controls are designed to have the look and feel of typical mobile controls. And they do look nice, and work well. In the sample app I've been showing you, there's a bar across the top for navigating through the pages in the app, and it looks like the bar you'll see in a typical iPhone app. And the controls, when possible, make use of the native controls. The combo box, for example, opens up the selection box you expect. On an Android device, it's a list of radio buttons; on the iPhone the same control in the same app will instead have the iPhone's standard rolling selector thingy. That's a nice touch, as you can target different devices without having to make a single change to your code. Included with the IDE is a nice deployment feature, which makes it easy to upload your app to a web server. By default, the deployment is on a free test server the NS Basic company lets you use. But that's just for testing; the app gets deleted automatically after ten days. But it's handy because you can type the URL into your handheld device, and try the app out right away. I have to say, it was pretty cool to create the app, click Deploy, and then pick up my phone, put the URL in and see it right there on the phone. When you're ready to deploy the app for real, you can open up a Deploy Options dialog box and enter in your own server information, including username and password, so that the app can be uploaded to your own server through the same Deploy menu item. So far this is a decent product. The library seems to have a lot of features, including some things I didn't expect to see (such as integration with the SQLite databases available to some devices). I've worked with both Titanium and PhoneGap, but there doesn't seem to be much code out there where I can run tests on my own variations. Does NS Basic have a decent enough following where I could try some mixing of various functions from other projects? Where can I find apps created with App Studio that are more complex than the examples supplied? I am using javaworld and OpenPlug for developin APP, but the tool you share seem littile complex, might be it's due to the reason that I use to of using thap App for Mobile Development. Can I get its complete tutorial that Help me to learn that easily. It look user friendly but took some time to get full grip on it. NSBasic App Studio is utterly awful! It has driven my team and I nearly insane with the countless bugs it contains. If you want to end up in an asylum, use NSBasic to develop your mobile device apps! Tim is a troll. Apparently he searches the web for reviews and mentions of App Studio and puts the exact same post up each time. He's been doing this pretty much since the product hit the market. I don't know what his problem is, but since nobody else seems to be of his opinion (App Studio has its flaws, particularly the lousy documentation, but no, it doesn't contain "countless bugs") I wouldn't pay any attention to him. Tim is right. I had many problems with previous version and repeatedly wrote to developer. He provided some work arounds but no fixes, to the point that I gave up and recommended Tech Basic to all my clients instead. Now the developer does not wish to give me refund or upgrade to new version "without many bugs" for free! If you know VB then NSBasic is really great! In 60 minutes I've got further than 6 months with other IDE's. For 50 quid it's a bargain and very easy to use. I'm not clear what the problem is with the docs either. There's tons of sample code files and reference docs, even the manual for a complete 4 day programming course is included! It's a joy to create a web app and have it running in moments on the mac iphone sim or live on my own phone. Brilliant!! !